NicaBell's Beauty Blog: Get That Droid!!!! I can't take this out of my mind right now! I am uber excited!!! 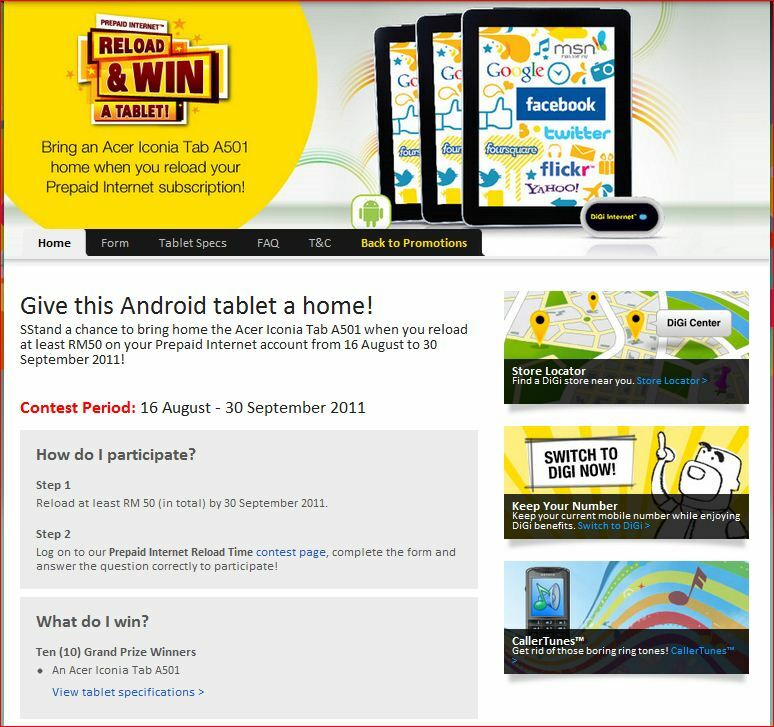 I WON AN ACER ICONIA TAB A501!!!!!!!! YYYYYAAAAAAAAAAAAYYYYY!!!!!!!!!!!!!! Well technically it is my boyfie who won the prize. He will never get IT! ROFL! Anyhow, congratulation my dear for winning the prize!! What happen is that I have been looking, searching high and low to get a Prepaid Internet here in KK but never had a chance to get one. Probably because I was looking at the wrong mobile phone shops. So I (technically) force my boyfie (yes, poor him) to get one for me. I was desperate because it was hard to get into the internet in my office at the time. Therefore, I told my boyfie to get one for me no matter how. He was pissed by the way. But he have a strong sense of responsibility to help me because he was unemployed at the time and I have been using my monthly pay to support the both of us including paying one of his car loan. Then, he found that Prepaid Internet sim-packs were sold in Inanam town. Therefore, he bought it and register under his name. I have been reloading the Prepaid Internet for RM10 per 2 day (which mean RM5 per day) because I wasn't using it regularly at the time. But then I found out that if I pay/reload more, the cheaper the internet service will be. *note: table above shows the days validity of using or data access of the Prepaid Internet. So I decided since I getting to get to use more and more internet for research information purposes, I decide to reload RM100! 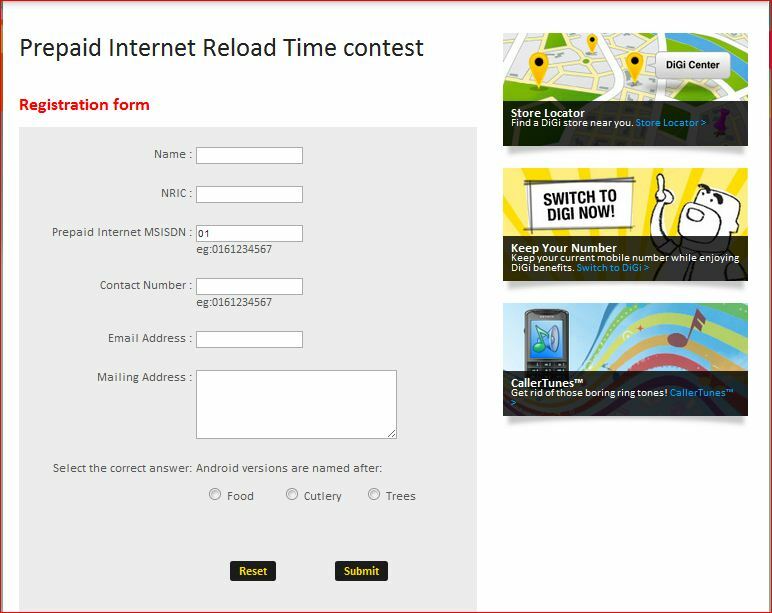 Then, just before I am going to reload the sim, I got a message which remind me (or my boyfie to be exact), to enter the Get That Droid contest via online! I wasn't thinking too much as I just think there are no harm trying. There is only 1 question and it was easy. And below are the 2 snapshot of the contest homepage and its contest form. So 7pm this evening, boyfie suddenly got a call from Digi Telecommunication helpline. Though I was already informed my boyfie that I entered his name in the Get That Droid Contest, he was still quite puzzled when the operator told him that he won a ACER ICONIA TAB A501! He confirmed his name, Identification Card number as well Prepaid Internet sim card number in his puzzling face. He ask for my house mailing address so I gave him. I was expecting that Digi was going to send some complimentary prize. And when my boyfie hang up his found, he said that if Digi Helpline number could have tricked him? He was skeptical as there are sooo many telephone scam nowadays. So I assured him that the call was from Digi Helpline number so it could not possibly someone trying to scam him. Then, we both became excited! I search for the review of the tab and found out it was just launched around April 2011!! I am excited to get the prize. I hope they send it tomorrow! I can't wait to get my hand on it! I'll be keeping update on it. See ya! p/s: seems like I'm postponing my promise to give a review on the Maybelline lipstick. Sorry peeps!